Man-O-War Cay is a very peaceful and self-contained little island where the only acceptable means of transportation is by Golf Cart! A magnificent white, sandy beach lies on the Atlantic side of the island where you can swim, snorkel and beachcomb to your heart's content. There are several small restaurants and gift shops including the famous Albury Sail Shop where you can see a wide variety of canvas products being made. 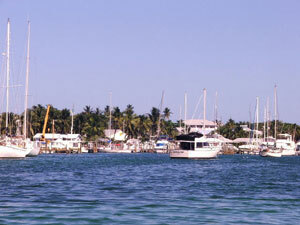 Man-O-War Cay (named after the bird) is renowned for shipbuilding. One of the most popular places to visit is Joe's Studio where you can see scale models of traditional wooden Bahamian sailing dinghies being built. Along the shoreline you'll see that some boats are still handmade (without plans) in a tradition passed down through the centuries. Wander aroud this friendly village and witness people busy at work - locals are usually keen to stop and chat! If you're feeling energetic, head for the only Baseball field in Abaco. It overlooks the Atlantic Ocean with the most stunning views. The equipment is usually left out for folks to use and if you have a larger group you can organize a game, the locals will often be happy to join in!